A New Ancestor of Man: Palaeanthropus of Palestine, Representing "A Distinctive People Unlike Any Other Race of Prehistoric Men"--A Reconstructed Drawing. The recent discovery of "a series of Stone Age deposits so far unparalleled in the Near East," in the Valley of the Caves at the foot of Mt. Carmel, is described on page 36 of this number by Miss Dorothy Garrod, Director of the Joint Expedition of the British School of Archaeology in Jerusalem and the American School of Prehistoric Research. On two other pages will be found an article by Sir Arthur Keith, F.R.S., explaining the high importance of these discoveries, which comprise eight skeletons, four of them practically complete. 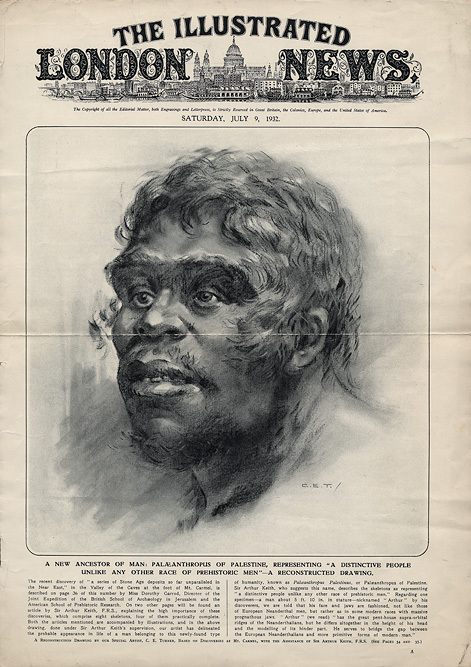 Both the articles mentioned are accompanied by illustrations, and in the above drawing, done under Sir Arthur Keith's supervision, our artist has delineated the probable appearance in life of a man belonging to this newly-found type of humanity, known as Palaeanthropus Palestinus, or Palaeanthropus of Palestine. Sir Arthur Keith, who suggests this name, describes the skeletons as representing "a distinctive people unlike any other race of prehistoric men." Regarding one specimen--a man about 5 ft. 10 in. in stature--nicknamed "Arthur" by his discoverers, we are told that his face and jaws are fashioned, not like those of European Neanderthal men, but rather as in some modern races with massive prognathous jaws. "Arthur" (we read) "has the great pent-house supra-orbital ridges of the Neanderthalians, but he differs altogether in the height of his head and the modelling of its hinder part. He serves to bridge the gap between the European Neanderthalians and more primitive forms of modern man." In the brief statement made by Miss Dorothy Garrod (on p. 36) there are certain omissions. There is no explicit mention of the part she has played in the discovery now announced from Mount Carmel--one of the most extensive and most important finds ever made of the remains of fossil man. Mr. MacCown, who is excavating the Cave of the Kids, has told me that his good fortune--and no one ever earned the smile of fortune more than he--was planned for him by Miss Garrod; the excavation of the Mugharet es-Sukhul was part of a systematic search launched by Miss Garrod along the western flanks of Mount Carmel in the hope of discovering the earliest Palestinians. These early Palestinians, it was suspected, would prove to be the counterparts of the Neanderthalians of Europe--that strange race of humanity which became extinct long before the end of the last Ice Age. As everyone knows, the culture of the Neanderthalians is known as Mousterian. Miss Garrod had struck rich veins of the Mousterian culture in the eaves of Mount Carmel, and had found stray fragments of the Palestinians who practised this culture: now it has fallen to Mr. MacCown to uncover one of their cemeteries--a cemetery 20,000 years old--and more. The cavernous mausoleum in which Peking man and his contemporaries were found is much older but less extensive than this cemetery on a ledge of Mount Carmel; indeed, this Carmelite cemetery is the most extensive mid-Pleistocene graveyard that has been discovered so far. Why was it suspected that the folk who practised the Mousterian culture in Palestine would prove to be of the same race as the Neanderthalians of Europe? It was because of a discovery made in 1925. In that year Professor John Garstang was directing explorations carried out by the British School of Archaeology in Jerusalem--a society maintained by voluntary contributions and chiefly concerned in the excavation of Biblical sites. In 1925 a young Oxford graduate, Mr. Turville Petre, joined Professor Garstang, and in a cave on the west side of Lake Galilee had the fortune to strike a rich Mousterian stratum in which was preserved part of a fossil human skull. Only the forehead with two adjoining bones were found. These were committed to me for examination and report. Although the three bones thus found possessed certain peculiar features, yet, as they were stamped by definite Neanderthal traits, I inferred that, as the front of the head was mainly Neanderthal, the hinder part of the head, when found, would prove also to be so. So I drew the conclusion that the ancient Galilean people would prove to be a branch of the extinct Neanderthal species. The first suspicion that I had been misled arose during last winter, when Mr. MacCown and I were examining the skeleton of a Carmelite child. As Miss Garrod has explained, Mr. MacCown, when exploring in 1931 the Mousterian stratum of the Cave of the Kids, which this year he has proved to have been a cemetery, exposed part of a child's skeleton. The block of breccia, or rock, in which the skeleton was entombed, was cut out and brought to the Royal College of Surgeons' museum in London. In three months Mr. Ernest Smith had cut away the rock and exposed the skeleton of the child, so that Mr. MacCown and I were free to study it. The child had been buried in a kneeling position. To our surprise we found the hinder part of the head was totally different from that of all European Neanderthalians. The skeleton of the child was also different, being akin to that of Australian aborigines. How different the hinder view of this child's head was from that of Neanderthal child will be seen from Figs. 3 and 4, in which the occipital view of the Carmelite child's skull (aged 2 1/2 years) is compared with that of the Neanderthal child (aged nine years) from La Quina, France. The Carmelite child lay in a cave deposit of the same Mousterian culture as the Galilee individual; the Carmelite rockshelter is less than forty miles distant from the Galilean cave; the Carmelite child and the Galilean woman should be of the same race. Even to-day it is very difficult to anticipate what the features of a child of 2 1/2 years will be when it has attained maturity. It is still more difficult to forecast the adult form of a child of an unknown prehistoric race. To settle the problem which Mr. MacCown and I had to solve, an adult stage of the Carmelite child had to be found. At the end of March of the present year Mr. MacCown left me for Palestine. Owing to Miss Garrod's illness he had to take charge of the excavating party; in less than a month the newspapers announced that he had been successful. In the same stratum as gave the child he has now found complete or partial skeletons of eight other individuals. Two of these are represented in the photographs here reproduced (Figs. 8 and 9)--the first which have come home. They were taken for Mr. MacCown by the photographers of the Megiddo Expedition of the Oriental Institute. The result is to prove that the Ancient Palestinians, whom we came to know of first by Mr. Turville Petre's discovery at Galilee, and then by the finding of the child in the Cave of the Kids at Mount Carmel, were a distinctive people unlike any other race of prehistoric men. They resemble the Neanderthalians of Europe in many of their traits, so that we must assign them to the same group or genus. But they also show many features which link them to the most primitive of modern or Neanthropic races--especially to the aborigines of Australia. Now, the name Palaeanthropus has been given to the earliest of all known Neanderthalians of Europe--him who is represented by the fossil jaw of Mauer (Heidelberg), and, as these Mousterian Palestinians must, in my opinion, be grouped with the Neanderthalians, but are different from the European species, I propose they should be known as Palaeanthropus palestinus. The Palaeanthropus of Palestine helps to bridge the evolutionary gap between the more primitive of modern races of mankind and the ancient and extinct Neanderthal species of Europe. If not the ancestors of any living race, they must be nearly on the line of modern descent. Rhodesian-man was their first cousin. 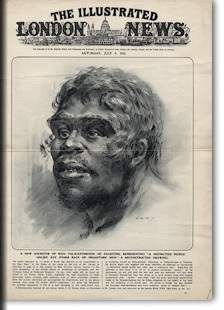 Another recently discovered cousin is Homo soloensis of Java (see Illustrated London News of June 4, 1932). Presently we shall know more of the Palaeanthropus of Palestine than of any ancient type of humanity. We already know the childhood of the race; the skeleton of the Carmelite child--known to the excavators as "Wilhelmina"--revealed that much, The photographs of the skulls and skeletons of two adults reveal the fullblown characters of the race. The skeleton of No. V.--known colloquially as "Arthur"--is that of a tall man, about 5 ft. 10 in. in stature, who was buried on his back (Fig. 8). His thighs were flexed on his body, his arms were bent with hands laid on the right of his head. His head was inclined against his right shoulder. Between his flexed arms was placed part of a wild boar's head. His face and jaws are fashioned, not as in the Neanderthalians of Europe, but rather as in some of our modern races, with massive prognathous faces. In several respects the face of the ancient Palestinians may be described as negroid, but he had one feature never seen in negroes, namely, a narrow high ascending ramus of the lower jaw. Strange to say, the narrow high ascending ramus, set almost at right angles to the body of the lower jaw, is a feature which is still preserved in certain brachycephalic peoples of the East. The Palestinian Neanderthals differed from their contemporaries of Europe in having modern chins and deep heavy jaws. "Arthur" has the great pent-house supraorbital ridges of the Neanderthalians, but he differs altogether from his European counterpart in the height of his head and in the modelling of its hinder part. He serves to bridge the gap between the European Neanderthalians and more primitive forms of modern man. No. IV. is known, if I may tell tales out of school, as "Dorothy." She was buried in what may be described as the "swimming posture"--legs drawn back towards the body, as if preparatory to making a stroke, head "above the water," and arms bent by the side of her chest (Fig. 9). She was probably about 5 ft. 6 in. in stature; her head has been crushed by the weight of the material over it. She has disgracefully strong eyebrow ridges for a woman. As in the Australian aborigines, the lower limbs are relatively long below the knee in the three ancient Palestinians so far examined. Such are the revelations which Mount Carmel is now making to the world. Readers must not think that such things happen just by chance. They have been worked for; those interested have put their hands in their pockets to help voluntary workers to unravel the long past history of man in Palestine. None has been more liberal in his support than Sir Robert Mond; indeed, without his help these discoveries could not have been made. Splendid assistance has also been given by the American School of Prehistoric Research under Professor MacCurdy, of Yale. Now the need for help becomes more urgent. The skeletons which are being exposed in the rock-shelter of Mount Carmel cannot be examined on the spot. They have to be cut out with the block of rock in which they are embedded and carried to a laboratory, where a year or more will have to be spent in chiselling the rock from their bones. The block containing the skeleton of "Arthur" will--when it is cut out--weigh well over a ton; "Dorothy's" block cannot weigh much less. All such explorations cost money, and in the present economic crisis just those who were the most liberal in their support of prehistoric research are also those who are now the least able to respond to our present emergencies. In Biblical narrative there is no episode which has impressed itself more vividly on popular imagination than that of Elijah with his servant, on the summit of Mount Carmel, looking over the Levant for the cloud which betokened rain for Ahab's parched plains. That episode happened 3000 years ago. Down below the prophet as he sat on Mount Carmel was the Mugharet es-Sukhul in which there had been sleeping for countless thousands of years before his time the strange family now brought into the light of day.